Everything we’ve won: they want it back! The following is the text of a leaflet given out in Nottingham in March 2011 around the time of the City and County Council budget setting meetings. The full leaflet can be found below and as an attached PDF: Everything we have won they want it back [PDF]. Anarchist organisations such the Anarchist Federation are active against the cuts and wider austerity measures internationally. Here we set out the way that we see the cuts in Britain in the context of the build-up for the TUC’s forthcoming March for the Alternative on 26th March in London. Trade unionists and community campaigners from across Nottinghamshire met on Thursday night to plan united resistance to the coalition government’s cuts. More than 150 people attended the meeting. The meeting was addressed by local MPs Vernon Coaker and Lilian Greenwood, both of whom condemned the cuts and offered their support to trtade unionsists opposing them. 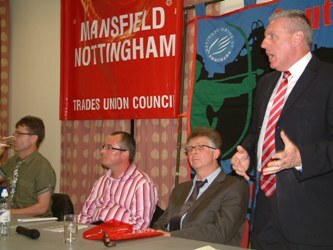 Nottinghamshire councillor and leader spoke of the devastating cuts being imposed by the Conservative controlled council. The meeting endorsed a call for a mass demonstration at the Conservative conference in Birmingham on 3 October. 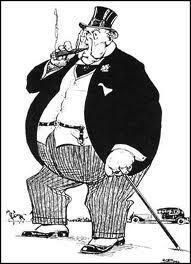 Nottinghamshire Trades Council will be running a free coach to the demo. Get involved by contacting us at nottstc@gmail.com. If you have pictures or stories from the meeting please get in touch. It was a great meeting and appropriate for the Trades Council to be one of the main bodies starting the fight back. It feels like the best thing since the poll tax rebellion, and it was great to hear speakers referring to the significance of community action in that struggle, how there is no real difference between workers and service users, and that we all need to be in that campaign. Also, there were people representing the views of retired and disabled people, again because there is no difference between our interests. We need to be creating and supporting groups of unemployed people and others on benefits to defend themselves too though. Some some people are already starting something up in that area. But the write up ignores cuts that Labour have and are making. It’s worded very carefully to make it appear that Coaker and Greenwood spoke in support of people fighting cuts generally, which they pointedly didn’t. What’s the point working with Labour party representatives who won’t condemn or even pass comment on how the City Council should respond to the cuts. It’s all very well calling for unity, but you can’t be united with people responsible for wilfully destroying the public sector/putting it up for sale. I understand where it is coming from in terms of the various agenda’s of socialists who want to influence the Labour party and those who want to set up alternative workers’ parties. But you should make your agendas clear, not obscure them with bogus calls for unity. It’s just rhetoric and doesn’t reflect our reality. People will wonder why on earth a campaign against cuts is’united’with people making the cuts. They might be put off by not understanding such a confused message and we might lose them. Anyway we all agree that we need to start trying to set up groups in all aprts of the city and county. We might not attract thousands until the cuts really start to bite, but we should be able to attract hundreds if we get our message clear and our agenda transparent. We handed out this leaflet at the meeting: AREN’T LABOUR AS MUCH TO BLAME AS THE TORIES?